The Global Volcanism Program has no activity reports for Adwa. The Global Volcanism Program has no Weekly Reports available for Adwa. The Global Volcanism Program has no Bulletin Reports available for Adwa. Adwa, also known as Aabida, Amoissa, or Dabita, is a stratovolcano in the southern Afar area immediately east of Ayelu volcano. 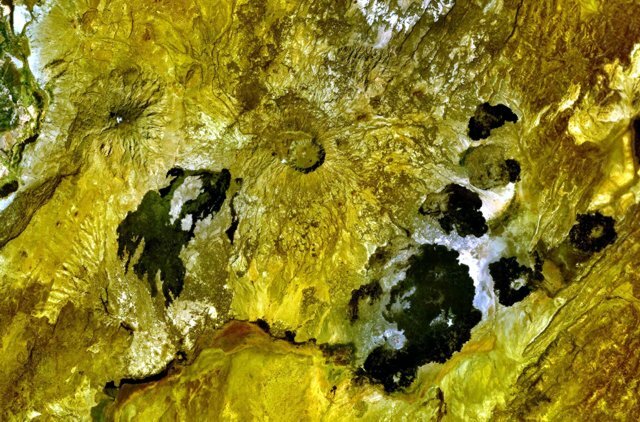 Adwa is younger than the vegetated Ayelu and is a stratovolcano with a 4 x 5 km caldera that originated following eruption of voluminous ignimbrites. A small 2.5-km-wide caldera cuts a trachytic dome extruded in the older caldera. Scoria cones are located on the floor of a circular summit caldera and on its NW and SW flanks. Extensive young basaltic lava flows cover the flanks of Adwa and overlap a sedimentary plain to the SE. Many fumaroles occur within the caldera. Satellitic pyroclastic cones and lava domes were considered to be only a few hundred years old (Mohr 1980, pers. comm.). There is no Deformation History data available for Adwa. There is no Emissions History data available for Adwa. There are no samples for Adwa in the Smithsonian's NMNH Department of Mineral Sciences Rock and Ore collection. Large Eruptions of Adwa Information about large Quaternary eruptions (VEI >= 4) is cataloged in the Large Magnitude Explosive Volcanic Eruptions (LaMEVE) database of the Volcano Global Risk Identification and Analysis Project (VOGRIPA).